Construction is a means of making your business more successful. CCC understands that its customers are not in the construction business, and that QUALITY is the key to a successful building project. Therefore, CCC takes responsibility by making experienced on-site decisions and completing the job to your satisfaction. We also assume the risk. CCC offers fixed price contracts and 3D modeling/BIM in advance to ensure the process is easy for you. Whether you are building a conventional or pre-engineered building, you can rely on CCC to focus on your particular needs and to deliver the highest quality construction possible. CCC will finish your project on time, within budget, to exacting standards, at a competitive cost. As a reliable partner throughout the construction process, CCC stands by its word. President and CEO, NuWaves Engineering, Ltd.
Technology is transforming the way buildings are designed and constructed. CCC is an industry leader, incorporating the benefits of advance technology in all of our projects. We create 3D models for all of our projects, at no additional cost to our customers. The 3D models, known as Building Information Modeling or B.I.M., allow you to experience your building in a new way: it is a virtual walk-through with furniture and equipment in place. Design changes can be made in real-time. Most importantly, it allows us to uncover design issues before construction begins. That can mean significant cost savings for you. 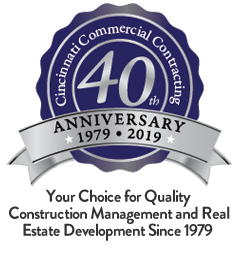 In conjunction with Butler Manufacturing, CCC offers pre-engineered buildings that are the #1 choice for commercial buildings in the Greater Cincinnati area. Butler has designated CCC as a Career Builder, a designation bestowed on builders that have demonstrated total competence. Established in 1901, Butler Manufacturing Company is the world’s leading producer of pre-engineered metal building systems. They offer a wide variety of structural, wall, and roof systems for almost any building situation. These systems not only promote longevity and stability, but safety, aesthetics, cost-effectiveness, and in many cases, environmental protection. As a Butler Career Builder, CCC is proud to offer its customers the best metal buildings in the industry.